Explanation: Does this strange dark ball look somehow familiar? If so, that might be because it is our Sun. In the above image, a detailed solar view was captured originally in a very specific color of red light, then rendered in black and white, and then color inverted. Once complete, the resulting image was added to a starfield, then also color inverted. 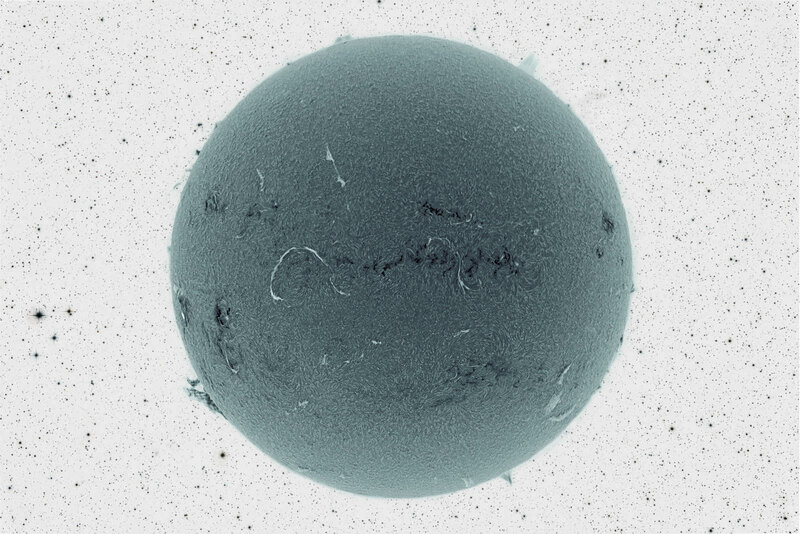 Visible in the above image of the Sun are long light filaments, dark active regions, prominences peeking around the edge, and a moving carpet of hot gas. The surface of our Sun has become a particularly busy place over the past two years because it is now nearing Solar Maximum, the time when its surface magnetic field is wound up the most. Besides an active Sun being so picturesque, the plasma expelled can also become picturesque when it impacts the Earth's magnetosphere and creates auroras.